Below is our review of the Dell Inspiron 15, a 15.6" laptop, featuring 4GB RAM, 500GB hard drive and Windows 7 Home Premium 64-Bit. The most noticeable aspect of the Inspiron 15 is the design. Or to be more accurate, the total lack of. That's not to say the Inspiron is ugly, or poorly designed, far from it - it just completely fails to stand out - plain would be the best word to describe the approach Dell have taken here. In a competitive price range, and in what is an overcrowded industry, with this understated design Dell aren't likely to put people off buying this notebook outright; however it is unlikely to persuade new customers not to purchase a rival's product, such as the polished offerings from Samsung and Sony. We have nothing against this type of finish - it's inoffensive, feels solid and is no doubt functional - however it just doesn't stand out against the competition, and for the want of a bit more thought and design input, Dell could quite possibly have increased their sales considerably. If you consider the amount of money Apple, Samsung and Sony spend on marketing their image rather than their actual products, Dell seem to have taken a bit of a strange decision in taking the reverse approach and concentrated solely on the function. And so that is what we shall focus on in this review. As mentioned the casing is plain black, and as per most of Dell's range, feels very sturdy to the touch. In terms of both thickness and weight, Dell seems to have concentrated on making this laptop as solid as possible - and although we obviously didn't test this, it feels as though it would cope with being dropped better than laptops of rival manufacturers. That said the extra size and weight may make it less suitable for those who have to regularly commute and travel, despite clearly being sturdy enough for this kind of usage. Upon opening the laptop you are confronted with what appears to resemble a standard PC keyboard - chunky buttons placed in close proximity to each other. However unlike many other laptop models in this price range, it doesn't span the width of the chassis, and instead there are gaps to the sides. The keys are regular sized, but there isn't the bonus of an inbuilt numerical keypad to the right. At this point, the spreadsheet users and accountants amongst us will be turning around in disgust, and looking for a more suitable model. That said the keyboard works well and feels comfortable to type on. All in all we were of mixed opinions on this aspect of the notebook - yes, again it feels very sturdy, however due to the buttons positioning and depth it will be more difficult to keep clean, and the lack of a numerical keypad will be a disadvantage for some. The touchpad again felt sturdy, and as though it would put up with years of usage. We had no problems with accuracy or sensitivity - controlling the notebook and browsing the web was straight forward - and can not envisage any issues in this department what with Dell's reputation for overbuilding notebooks. Surrounded by a reassuringly thick bezel, the screen is 15.6" in size, and offers a clear picture. Again no faults with this aspect of the notebook - users will also be able to output the picture via VGA or HDMI. Inside you'll find Intel Core i5 2430M processor, operating at 2.4GHz. This was more than suitable for household usage - from everything from playing HD movies, to less intensive tasks such as browsing the web and checking e-mails - this handled all that we threw at it. backed up by a substantial 4GB RAM, this notebook should provide you with a good few years of service. Storage is catered for by a spacious 500GB hard drive, which should be ample for most users, with room for your music, files, software, photos, and a few movies. This is boosted by the addition of a DVD RW drive to the side, and an SD card reader situated to the front of the notebook, enabling you to easily make backups. Further to this are the inclusion of 3 USB ports to the side, thus giving you options for any portable devices and external peripherals. Battery life is a bit of a stumbling block for this laptop - this obviously won't be an issue for those who aren't on the move - however we probably recommend this notebook for commuting and travel purposes. It isn't awful by any stretch of the imagination, however many of Dell's rivals laptops offer longer times between charges, and such we'd score them higher in this department. 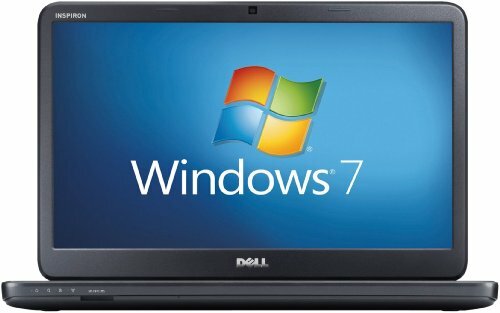 The operating system, as per virtually all notebooks on the market, is Windows 7 Home Premium - this runs fast, and we had no issues with reliability. So who is this laptop aimed at? It feel sturdy, and is pretty functional, yet weighs quite a bit and is also fairly large for a 15.6" laptop. Battery life isn't amazing, although depending on your intended usage then this may not be an issue for you. The design is very understated, so maybe not for the image conscious, and the controls are solid and dependable, albeit with the lack of a numerical keypad. All in all we'd recommend this as a laptop for family home usage - it's solid enough to put up with the wear and tear associated with little hands, and runs pretty fast as well. Pros: Great build quality, feels solid, and a pretty good specification. Cons: Weighs quite a bit, no numerical keypad and battery life is relatively poor. To conclude - if you're after a laptop for using around the house, then the Dell Inspiron 15 could be ideal - it will be as solid as any other laptop on the market that we've tested, and so less prone to breakage.